We are not the same species, but our souls are made of the same matter. There are both animals and humans I loved that are not among us anymore and I miss them greatly. I believe they did not just disappear into nothingness. I believe the soul is eternal. I am an atheist, but that has nothing to do with my beliefs. I miss them so much, those beautiful souls, that loved unconditionally and were loved back. Love and care for your dear ones every day, you never know how much time we have left together on this Earth. Alfred, Albert’s and Claire’s brother from A-litter died February 4th. He was born May 23, 2010. He was an emotional, generous, expressive, loving cat with opinions and when his future Mom came to us and met all the seven kittens, he went to her and sat in her lap. He chose her (he never did that to anyone else that came to visit us during their first three months of life). There was a connection and affection between his Mom and him from the moment they met. We are glad that he got to spend all the time he had in his short life with her, her little daughter and his sister Ada, also from the first litter. It took me almost two weeks to gather strength to write that he died. I cried every night and during the days. The worst part is that I know how much Alfred was loved by his family and how much he will be missed. He lived way too short life, but it was a good life, filled with much love. He was let go on the operating table, where the veterinaries tried to operate a rare form of abdominal cancer that progressed fast, that no one of the cats behind him in recent generations had and that he had no other risks for (FeLV or FIV virus). There is no known genetic component to that awful disease, but Siamese may be more prone to it than other races. It was too late, and he could not be saved, nor his life prolonged more than days. He was let go, and never woke up. Affe will always be loved and never forgotten. ♥ He brought so much joy and love to people around him, and that is how he will be remembered. A few pictures of Affe, when he was a kitten, taken 2,5 years ago. Ada and Affe who moved together to their new home last year had an exciting summer! Here they are, enjoying lovely Swedish summer (the pictures are taken in July). Ada is blue (darker), Affe is lilac (lighter). It is so nice to see them all grown up and big and so well taken care of. Thank Jenny for these and many more pictures you have sent us. 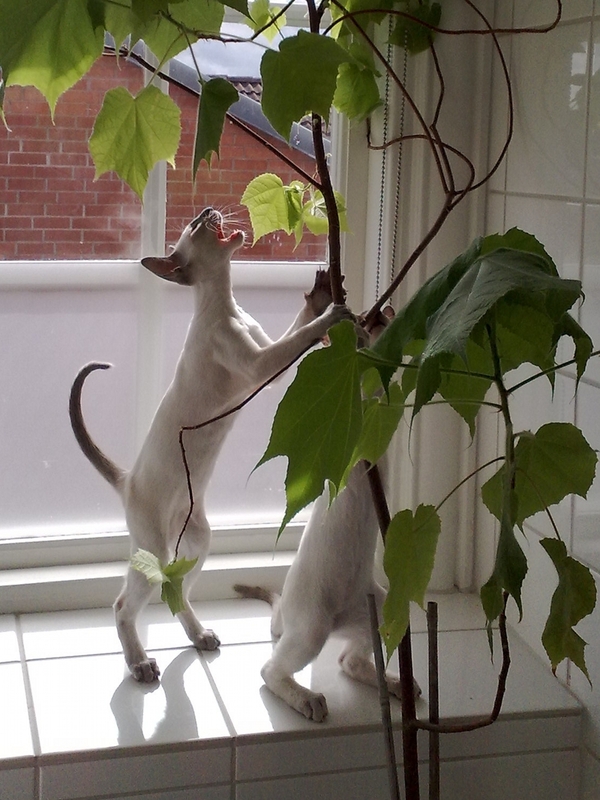 Also, a big thank you to all the kittens’ owners for the pictures and updates, we are so happy when we get them. We got the latest picture of Ada and Alfred from their beloved matte. They are so pretty! 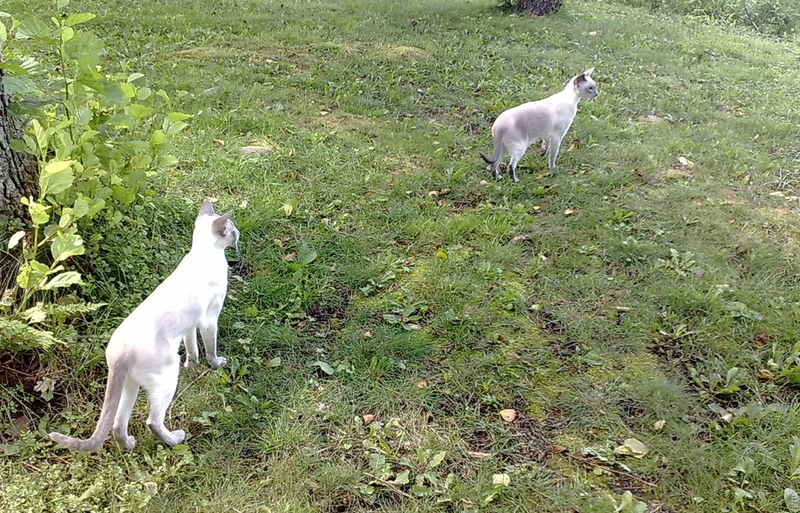 Ada is blue (darker) and Alfred is a lilac point Siamese (lighter in color). I suspected since they were three weeks old that Alfred was not lilac, but chocolate, and later I settled for caramel lilac, since his color was slightly different (warmer) than his two lilac brothers’ and Leroy’s and Jossan’s lilac color, but I registered him as lilac. I am still not quite sure what his exact color is, in 1-2 years one can be certain if he is caramel lilac or “just” lilac. 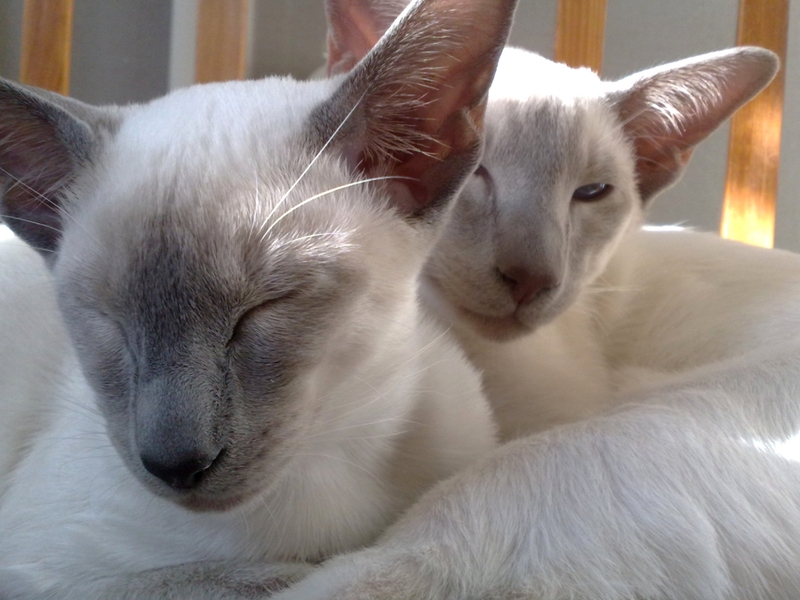 Caramel color modifier was not registered in Sweden earlier, not for Siamese (but it is registered in England, for example, and the cats we imported from England that were caramel lilac/caramel blue got registered as lilac/blue in Sweden). Caramel modifier makes the diluted colors like blue and lilac a bit warmer in tone. Also, the fur gets a special metallic sheen, at blue based caramels. 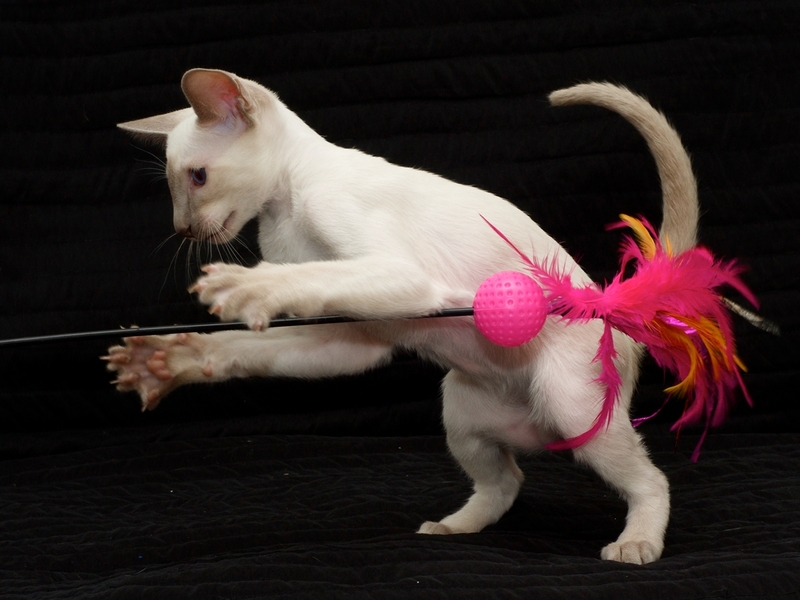 A chocolate or seal point Siamese that is a carrier of caramel modifier looks the same as the one who is not; caramel is not visible on undiluted colors. I melt when I see Jossan’s babies pictures, they are our little furry babies also, and I am delighted to see them growing and hear that they are so much loved and taken care of. We also got news about Ash (Archimedes). He weighs 3kg! A big guy! He was so tiny when he got sick, but he struggled like a lion and ate like he was the biggest feline on Earth after he recovered. 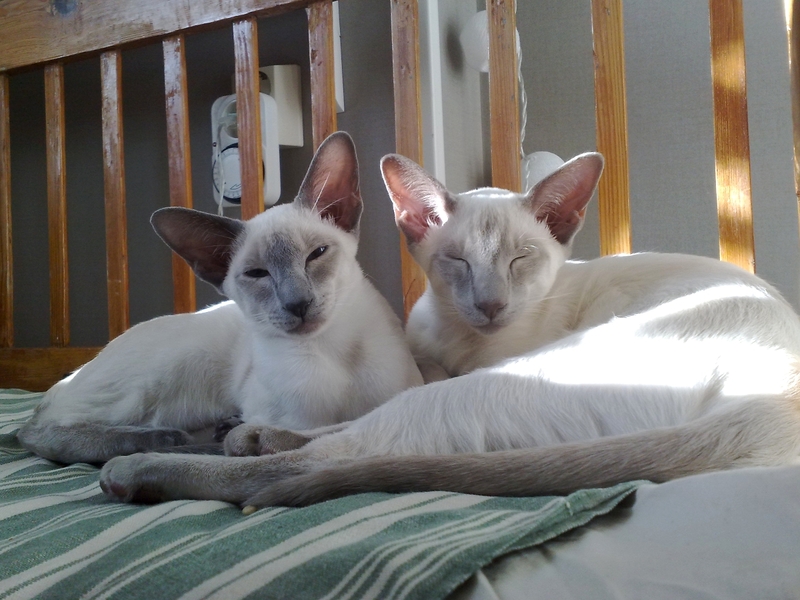 Now he is one big and fluffy Siamese kitten, that is almost as big as his 3,8kg heavy Cornish Rex friend Misty. Ada and Alfred moved together to Linköping, where they will live with one little girl and her mom. Alfred chose his matte when she visited the kittens and the little girl wanted Ada even before they met. I think that Ada and Alfred are a very good match, to live together, personality-wise. Also, they are very loved by their matte and her little daughter. Alfred is very talkative (Antoine is the most talkative, but Alfred’s vocabulary was the most impressive one) and gentle, but also quite active (although I do not know who was not active, all seven kittens were very active and social from the start). Ada was always so brave and curious and first with everything. A bit naughty, but so sweet. And the way she would look at you would make anyone melt. She and Archimedes (Albert a little as well) have the most amazing way to make an eye contact and simply hypnotize a person. Funnily enough, I think that the other four have the better eye shape, according to the Siamese standard, since they are more almond-shaped. But, I notice on Albert that his eyes are getting much more almond-shaped than they used to be. It is exciting to see them grow and change. On their way to their new home, 2 hours in the car, Alfred cried without stopping. But, upon arrival it did not take them a long time to make themselves feel at home. 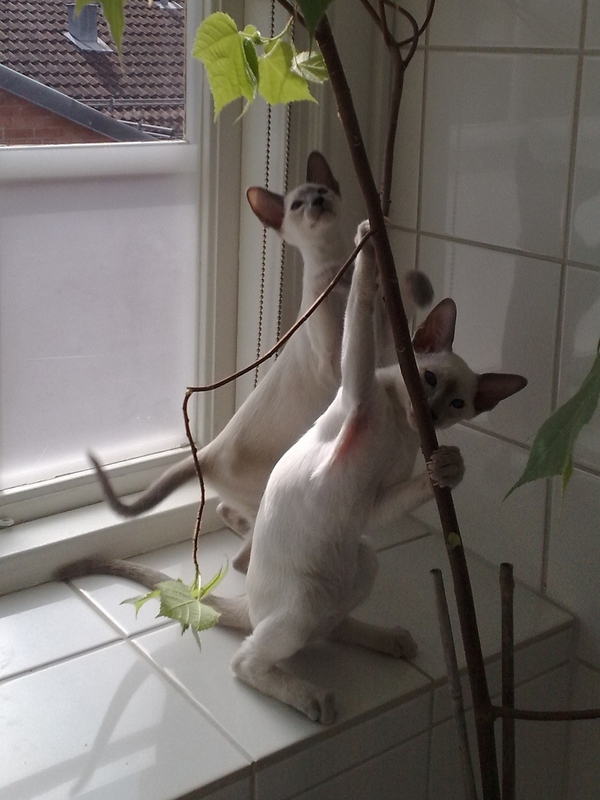 And, as you can see, they continued to develop their gardening skills that they started here. Many thanks for the photos we got from their matte!